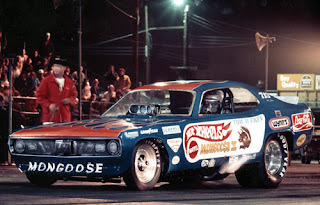 As drag racers from coast to coast make their way to Indianapolis for what in drag racing is known simply as "The Big Go", the annual labor day race is as important to most racers as winning a world championship. "I wouldn't trade my first win at Indy for ANYTHING. Here is the true story about the legendary status of the U.S. Nationals and what many consider to be the "Best Ever" Big Go. Updated 8/29/07: ...as well as AOL's "Hottest Woman in Sports" in the online fan voting competition following a decisive victory over Danica Patrick (the other Indy) in the semi-finals and Fastpitch Softball Hurler Jennie Finch in the Finals... Ashley Force now competes against the male winner for the overall title "Hottest Person in Sports". So, check it out and tune in to the extended 12 hours of coverage on ESPN2 over Labor Day Weekend for history in the making, check local listings for times in your area. UPDATE 9/4/07: Winners- T/F Tony Schumacher, F/C Mike Ashley, P/S Dave Connolly, PSM Creg Treble. John Force failed to qualify for the "Big Go" for the first time in over 30 years and daughter Ashley Force lost in the second round after qualifying #2.